The Indiana Jones franchise is and will always be one of the giants of the adventure genre. We should accept that when it comes to adventure, Steven Spielberg will never top Raiders of the Lost Ark, but in his defense, neither will anyone else. Sadly, Indiana Jones and the Kingdom of the Crystal Skull felt cartoony and done out of obligation rather than any sense of desire to revive the character. 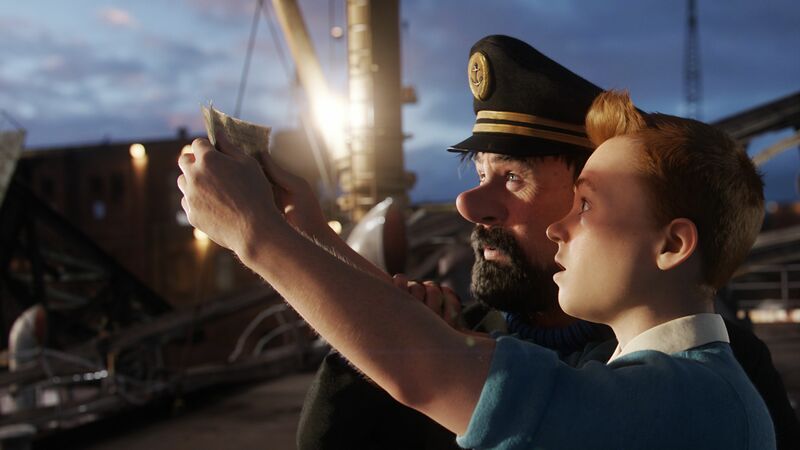 Spielberg picks up a fresh adventure franchise by adapting Hergé‘s internationally beloved Tintin comics, but The Adventures of Tintin manages to feel even more like a weightless cartoon. All the beats are correct and there’s no need to compromise or carry the baggage of Dr. Jones’ previous efforts, but Spielberg and producer Peter Jackson (who was a de facto co-director on the film) fall into the traps of using motion capture and 3D without understanding how to best utilize either technology. Tintin presumes to be a grand adventure but there’s no sense of danger and even if there were, there would be no reason to care about whether our heroes escape from it. 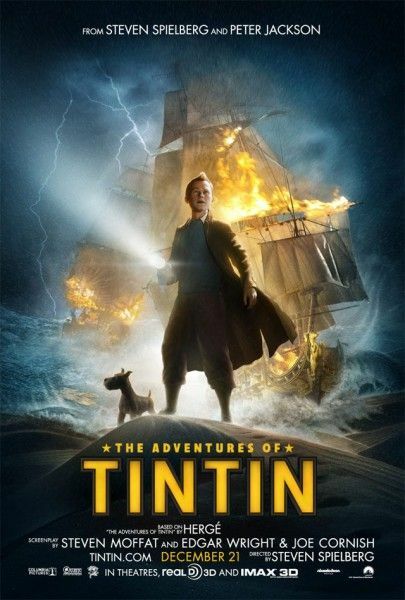 The film opens with adventurous young journalist Tintin (Jamie Bell) making a seemingly-innocuous purchase of a model version of The Unicorn, a ship lost at sea generations ago. But Tintin isn’t the only one who wants the model and the nefarious Ivanovich Sakharine (Daniel Craig) attempts to steal the miniature replica because it holds the secret to finding the real Unicorn. Tintin and his adorable dog Snowy become swept up in the adventure to find what Sakharine is up to and discover the secret of the Unicorn. However, that secret lies with the drunken Captain Archibald Haddock (Andy Serkis), and he’s too soused to remember it. Tintin makes a crucial misstep from the outset: it assumes we already know and love Tintin. Audiences who’ve read Hergé’s books and are familiar with the character will most likely carry that goodwill into the theater and project it onto the big screen incarnation. For everyone else, Tintin seems too uptight to be an adventurer. He methodically goes through clues and knows how to throw a punch, but he lacks any interesting flaws. He can learn to perfectly fly a plane in a matter of minutes, and his outstanding personality trait seems to be his annoyance with everyone he encounters. Haddock fares a bit better since he functions as the comic relief and he has a character arc, but the movie makes him a bit too one-dimensional by relying heavily on his drunkenness. Sakharine is one-dimensional as well, but he’s such a perfect embodiment of moustache-twirling villainy that the character works in a broad adventure. Tintin is meant to be in the same mold, but he’s a by-the-book adventurer, which really isn’t in the spirit of adventure. Playing adventure in such a predictable fashion is a problem that runs throughout Tintin. Spielberg and Jackson know how to hit the right beats and in theory the set pieces should be terrific. There are fist-fights, high-flying escapades, and an impressive single-shot chase through the streets of the fictional Moroccan city of Bagghar. But all of the action lacks weight because the scenes don’t tell us anything new about the characters. 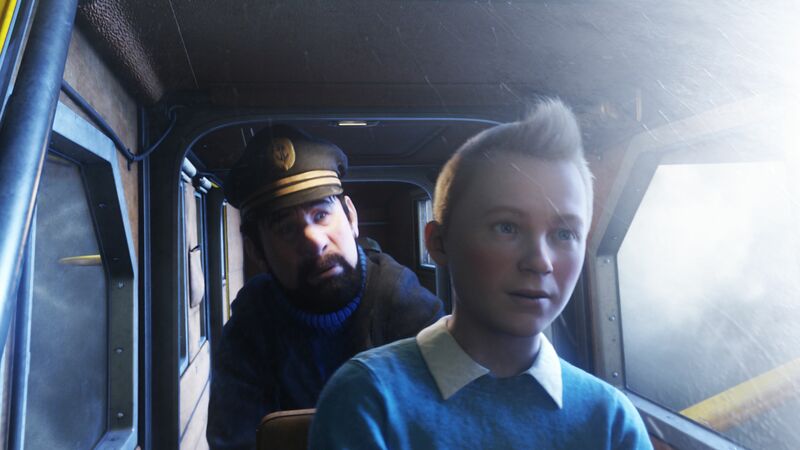 Tintin rarely feels like it’s living in the present because Tintin and Haddock are always looking for the next clue rather than experiencing adventure in the moment. It’s also difficult to buy Tintin as a real person when he’s able to fly through the air with the greatest of ease. 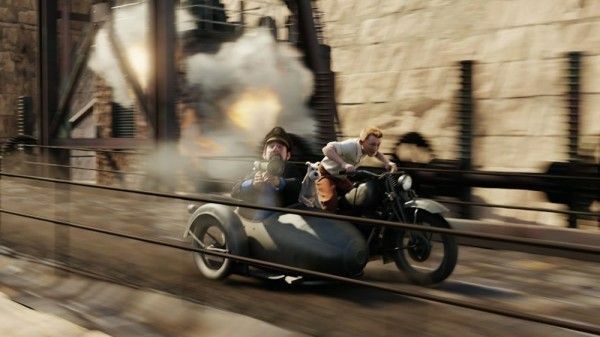 That lack of danger could be blamed on the animation, but other animated films can create a sense of death-defying action without any difficulty (Pixar’s Up is one of the best adventure movies since Raiders). The issue is the reliance on motion-capture, which grounds the movie with human actors but then wants to leave them behind whenever a big action scene is on the line. Superheroes get the same treatment, but Tintin and Haddock aren’t supposed to have superpowers. When Tintin rushes into traffic, there’s a sense of excitement and danger, but when’s jumping in and out of houses and surviving plane crashes, that realism fades away and we’re left to wonder why Spielberg and Jackson bothered with motion capture in the first place. The answer seems to be that the directors found a new set of toys and wanted to play with them. Unfortunately, they don’t realize these aren’t toys but tools and they need to be utilized correctly and thoughtfully or else they lose their purpose. I applaud the character designers for making the hybrid of human and exaggerated features look natural, but trying to blend realistic movement with superhuman feats never comes together. And Jackson should know better since he and his geniuses at WETA showed the world what mo-cap had to offer when they created Gollum. This misunderstanding of how to properly use recent technology is even more egregious when it comes to the 3D. It’s difficult to speak definitively on how much 3D causes a headache since everyone’s tolerance is different. Personally, I found The Adventures of Tintin to be one of the most headache-inducing experiences I’ve ever had. I’ve never had to take off my glasses so many times during a movie, and when I looked up, I saw a brighter picture and surprisingly, not much divergence (the more divergence in an image, the more 3D it looks when you’re wearing glasses). However, the amount of 3D is irrelevant, because none of it is used effectively. The set pieces are visually dynamic without the 3D and it feels like another tool Spielberg and Jackson used simply because they could. The Adventures of Tintin doesn’t have the phoned-in feeling of Kingdom of the Crystal Skull. Tintin‘s problem is presumption. It presumes we’ll love the characters. It presumes the motion-capture is necessary. It presumes that 3D will draw us deeper into the world. Everyone presume their approach will work, but Spielberg and Jackson’s presumptions are based on their enthusiasm for the project rather than taking a step back and critically examining what their movie requires in order to be an exhilarating adventure. There’s enough earnestness in Tintin to keep the movie honest, but it’s not enough to keep it exciting.